During my tours of churchyards and cemeteries photographing and recording the condition of wargraves, I also photograph those family graves on which a war casualty is commemorated. These are important because the inscription often carries historical and genealogical information not available from the official records. Furthermore, these family commemoratives being more personal are better than just a name on memorial to the missing. Having found a grave on which Robert HilL Bush’s name was mentioned,  I noticed that the marker suggested he was buried there at Chadwell St Mary Cemetery. The official records however, show that he was lost at sea. 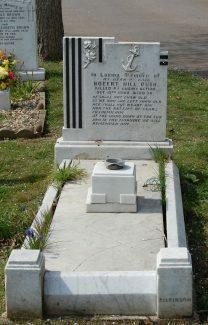 On checking with Thurrock Council’s cemeteries department, it was confirmed that he was interred there. The next step was to notify the Commonwealth War Graves Commission who add this information to their database and record the plot as a wargrave. As he is ‘adequately commemorated’ there, there is no need, at present, to mark his grave with the familiar white Portland headstone. 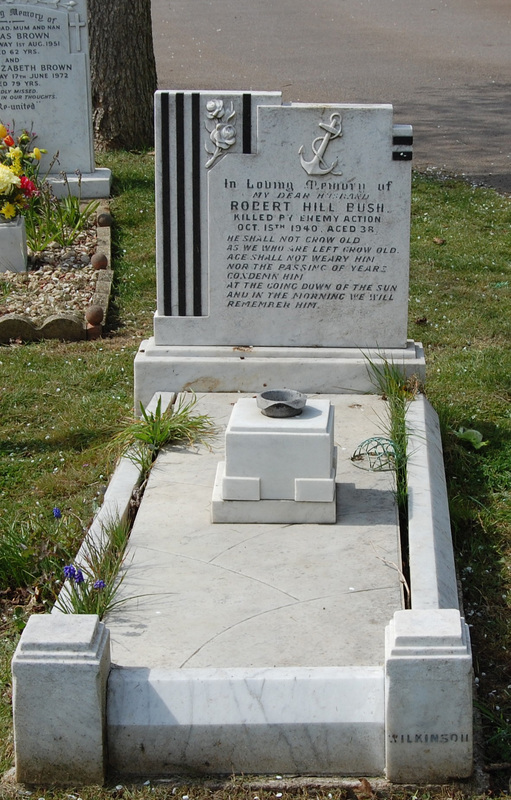 He was commemorated on the Tower Hill Memorial, the official point of commemoration for the Merchant Navy deaths of the two world wars, but in accordance with CWGC’s strict protocols, now that his grave has been found, his name will eventually be removed. Robert was Second Engineer Officer on M.V. British Glory [London] which was damaged by torpedo from U-Boat U-138 on 15th October 1940.His ship survived but Robert was killed. He was 38 and the son of Son of Robert Hill Bush and Minnie Bush, of Tilbury. He left a widow, Louisa Bush of Grays.